Legends have promised that, with each generation, whenever the call of evil rises from the shadowy realms beyond our own world that a hero will come to banish the cursed King of Darkness back to its accursed realm. Fortunately, those prophecies give us a pretty clear depiction of who we might expect. We’ve come to expect some shining golden hair and probably a mighty blade that all evil fears, perhaps with what must be a magical pack filled to the brim with unusual tools and magical devices, but there is only one clear requirement before the hero can even leave the village: a shield! Indeed, the prophetic hero should probably have a lot of strong skills. However, the gleaming Hylian Shield will provide exactly the protection necessary. While that exact artifact is sometimes hard to come by, this Zelda Triforce Shield is made with all the same love and craftsmanship… though we cannot verify it will protect the Chosen Hero from fireballs. 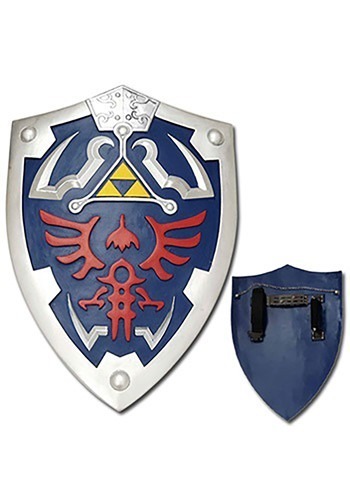 24 by 17 inches, the shield has a Velcro strap handle for either your arm or your back and raised textured emblems of the mighty Triforce and the Hylian Crest. You’re guaranteed to look awesome and, if coupled with the Hero’s garb and the Sword of Evil’s Bane, you may be the prophesied one we’ve all been waiting for!